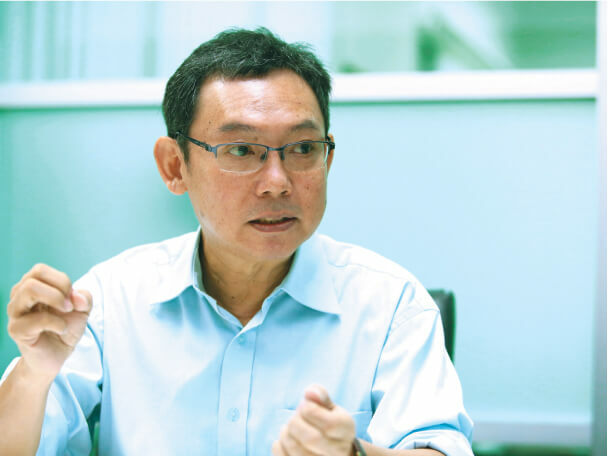 When we first interviewed advanced materials company Penchem Technologies Sdn Bhd, its founder and CEO Dr Ng Chee Mang was the quintessential geek, excited about new technologies and all the great stuff the company was delving into. At the time, Penchem was relatively new and still discovering itself, trying on different identities for size. Four years later, Ng is wiser. The company went through a tremendous struggle to survive, mainly because it had no focus and was run by, as he describes it, “technical nerds” who were good at inventing new things but not so good at selling them. Today, Penchem has grown up somewhat. It has discarded whatever was extraneous and is now focused on four main areas — light-emitting diodes (its bread and butter to begin with), thermal interface materials (which conduct heat), fibre-optic adhesives (which connect fibre-optic cables) and conductive materials. “We were doing encapsulations for LEDs before, but the business was moving too slowly. Basically, we were doing the epoxy encapsulation, that is, hard encapsulation. We are moving into silicone encapsulation, which can withstand outdoor conditions much better than hard epoxies. It is the next generation of LED encapsulation,” says Ng. The company had three major customers in Malaysia as well as customers from the US and Germany, but found that the LED business was slowing down and becoming stagnant. That is why it moved into thermal interface materials. “Let’s say you have an LED and you want to put it onto a metal. When you put it there, there will be a lot of air gaps, so the heat is not conducted properly to the metal to be removed,” says Ng. In fact, electric car company Tesla and aircraft manufacturer Boeing are testing out Penchem’s thermal interface material. Tesla is testing the material for use as a battery cover. “Electric cars use lithium-ion batteries. If you are not careful, they may overheat and the car would explode. We are looking to provide a cover for the battery, which disperses heat,” says Ng. Boeing is testing the material to remove heat from its LED lights. “When you light up the LED, eventually it gives off heat. We need to remove this heat from the LEDs,” he says. Ng is also excited about the company’s foray into fibre-optic connectors. “A fibre-optic network has all these glass fibres that need to be connected. Our adhesive goes into gluing the connectors together so they do not shift — because if they do, the signal will be lost,” he says. Ng is very upbeat about the potential of the huge Chinese market. In September last year, Penchem exhibited at the China International Optoelectronic Exposition and its booth received visits from more than 70 potential customers. “We connected with about 50% of them and hope it will go somewhere,” he says. The company has hired two agents in China to help it push its products there. “The Chinese market is very tricky and we do not have an office there. For us to keep going there is very strenuous so we needed to hire agents who based there to visit customers on a regular basis,” says Ng. It took the company a while to find good agents. “We had some problems with others earlier but so far, these two are quite good. We already have some business flowing from there and other prospects are starting to move. That is how we know about the market size in China — through our agents and the exhibition,” he says. Penchem has a very big customer in the US — a fibre-optic company — but Ng refuses to disclose the name. “They tested our material, which uses ultraviolet light to cure or harden materials. Normally, you would need to put the adhesive into an oven and bake it before it becomes hard so that the chip and connectors do not move. But in this case, we are using UV light, which hardens within seconds,” says Ng. He compares this glue to what dentists use to harden fillings. “But even if the tooth shifts, you can repatch it. For fibre-optics, you can’t. Once it is installed, it must work for years,” he points out. Its newest area, and the one Ng is most excited about, is conductive materials. “We think conductive materials will take off once we go into the market because when you talk about the Internet of Things, all those circuits need conductive materials. When you talk about things such as antennas and radio-frequency identification (RFID), you are going to need a cheap source of conductive materials,” he says. In fact, Penchem was awarded a grant by NanoMalaysia Bhd for its work in this area. “NanoMalaysia feels that we have the synergy and we make the materials for some of these devices — RFID, for example — and printing inks,” says Ng. Conductive inks allow the printed objects to conduct electricity. Silver inks, for instance, have multiple uses, including printing RFID tags on modern transit tickets. They can also be used to improvise or repair the circuits on printed circuit boards. The company has also grown up in other ways. Before, Ng used to run around like a headless chicken trying to handle everything. Now, he has hired a general manager to handle operations and someone with a sales background to help the company open markets. He is now able to focus on business development. “It was so tough on me previously. I had to manage the whole factory and go out and look for business as well. Now, the general manager takes care of the operations while I go out and look for business,” says Ng. The company currently makes about RM10 million a year and it plans to double this over the next few years. “But when we talked to our board of directors, they thought we were too conservative. They asked us to raise our projection to RM40 million in the next couple of years,” he says. The board of directors threw a challenge that, while not impossible to achieve, will take some doing. “But the thing is, you have to think differently. I think it is possible. We have built the foundation and now we are getting our act together and pushing the business,” says Ng. All this has not lessened its ardour for R&D. “We are still getting PhDs to come on board. In fact, a lot of interns love to come to our factory to do their training. We don’t complain. We pick those who are very good — those who get first class honours or with post-graduate degrees — to hire. We hear other industries complaining that they cannot get good people and we kind of wonder what happened because we have no problem with that,” he says. Well, their is one problem. Penchem’s multinational corporation (MNC) customers tend to pinch its staff. “In a way, it is good. Our customers steal our people, but then put them to work phasing in our products. So, it is a benefit for us,” says Ng. But it is not just internal staff who are pushing Penchem’s products. “We are also working with US and German MNCs. Sometimes, we buy the raw materials from these companies and process them into a finished product. And when they go travelling, they promote the finished products, which they can also sell. Basically, they help us extend our reach,” says Ng. At one time, Penchem was looking to go into the medical sector. But it has put those plans on hold for the time being to focus on areas that will bring it more immediate revenue. “It is very expensive to certify materials for medical devices and it takes much longer. We need to earn money first. That is the reality. If you cannot earn, you have no reason to exist,” says Ng.